Everything has been updated since !!! Microsoft is developing technology that turns wall surfaces in every room of a house into control panels for videogames and appliances. Speech Dasher appears to allow writing utilizing a combination of speech and a zooming interface controlled with gaze using an eye tracker. Attainment Switch: An app that turns an iPad into switches and a switch interface all in one! 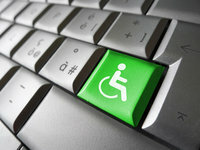 Are your mobile apps accessible? LookTel's Money Reader allows individuals who are blind or have low vision to know what denomination of money they have in their hands. 10/21 HiSoftware White paper, New NVDA Beta, NVDA v Jaws Wizard Duel ! 10 /07 Web Access Conferences, Imagine Cup winners, What is Dyslexia ?